Bright light city gonna set my soul on fire… If you know the tune, then you will have already figured out where we are going this week. So let's take a ride down the old I-15 to Sin City and have a look at "Queen of Diamonds," the new novel by partners in crime, Frank Zafiro and Jim Wilsky. Cord Needham is a big name on the Poker circuit; a real high roller and player to be reckoned with. He’s in town to defend his championship title and maybe to have a little fun on the side as well. Casey Brunell is a poker player too, but he has been playing a more dangerous game, running up debts that no honest man can pay with a local mobster and now he’s scratching at the felt. Casey thinks his luck has finally changed when he meets the beautiful Ania Kozak at the tables. But then again, so does Cord. “Annie” likes to play by her own rules and the stakes are always high. The only bet you can make is “all in” and in her games, cards aren’t the only thing that gets played. This novel had all the required ingredients to make it exactly my kind of book, and it didn’t disappoint. “Queen of Diamonds” is the second collaboration between Frank Zafiro and Jim Wilsky and it’s a partnership that runs like a well oiled machine. The story is told from the perspective of both Cord and Casey, alternating by chapter between the two protagonists. This dual narrative dove-tails seamlessly, with absolutely no jarring changes in rhythm or style, which might have been an area for concern in collaborations from lesser writers. The plot is tightly written and always engaging and the male protagonists are well described, but the real star of this show is the wonderfully duplicitous and insanely hot, Ania. The way she expertly maneuvers Cord and Casey like pieces on a chessboard marks her out as being a cut above your average femme fatale. 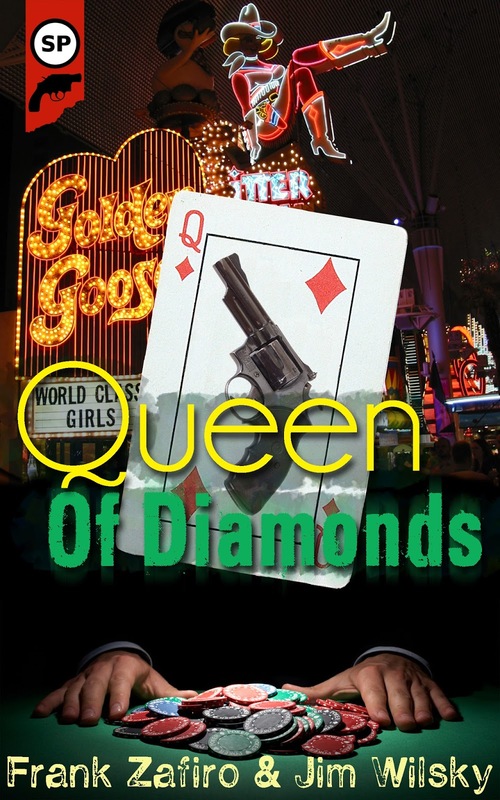 I’ve read a lot of books set in Las Vegas, but there are very few I have enjoyed more than “Queen of Diamonds.” It’s available now for a little over a buck on Amazon, so ante up folks, this hand is a real pocket rocket.